Confessions of a Wannabe Ad Man: Karl Lagerfeld and Creativity.. The man himself. Picture via Robtanphotos. Usual rules apply. I've been contemplating the nature of creativity for a little while now, and thought I should share with you a few quotes from Karl Lagerfeld as well as an interview I read with him. Obviously, as a planner, I'm interested in the process of creativity, and how best I can help stimulate creatives to make brilliant (and effective) work. Now, while fashion is a wholly different world to advertising in some respects (does it really matter if conventional models of effectiveness are adhered to in fashion? ), there are some fascinating similarities, and some thought-provoking pieces of thinking dictating how we go about creating new work. 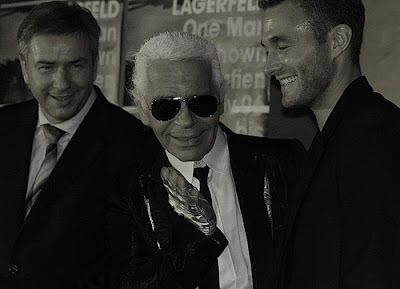 The first gem from Karl is: "I don't like standard beauty – there is no beauty without strangeness." Let's stop and think about this, in relation to advertising. Take the Cravendale work, right from the 'Cows want it back' through the current W&K 'Miiilk' executions. Distinctive, eh? I think so - and for me, the purpose of the advertising is to emphasise the moreish nature of the product, yet doing it in a wholly new way for the category, in the case of both executions. Compare this to the endlessly bland ads you see on a daily basis - when was the last time (honestly, without your advertising hat on), you tried to analyse a print ad, or a TV spot? I bet it was a long time ago - because what the industry perceives as beautiful - say a stunning piece of print art direction - has become something people expect, or have gotten used to seeing (that's not to say it can't be spot on, of course). In my opinion, some of the best outdoor stuff (Ogilvy's cigarette tanker for Cancer Research UK) and print (RKCR's 'Soon' for Virgin Atlantic). Both are very different, what I believe Lagerfeld infers when he talks about things being 'strange'. On with the quotes.."People who say that yesterday was better than today are ultimately devaluing their own existence." This one, for me, is interesting - it really speaks to the notion of what, I think, fashion is. And also why it is so widely decried as a waste of time by those people who see it as being fantastical, but ultimately a needless indulgence. Now, when cameras come into ad agencies, the results seem to be very similar - the general public seen it as a waste of time, rampant creativity at its worst. And yes, I've been in situations where you dearly wish people would remember their history (as they should), but that's not to say we should cling resolutely to Messrs Bernbach, Krone, Saatchi et al when it comes to playing with the notion of a layout, or challenging some of the limitations of conventional advertising. Essentially, continually striving to make the next piece of creative work the best it can be. Don't be content to have another car ad with it driving along fast, with a rock soundtrack. No, think about what the driving experience is actually like, for example. (After illustrating a model) "Lagerfeld ripped the drawing from the pad, crushed it in his hands, and tossed it into a large wicker hamper, which over the course of the evening filled with similar small masterpieces. 'I throw everything away!' he declared.' The most important piece of furniture in a house is the garbage can! I keep no archives of my own, no sketches, no photos, no clothes - nothing! I am supposed to do, I'm not supposed to remember!' He smoothed a gloved hand over the empty page in front of him and visibly relaxed." Now, I think that bit in particular is telling about the nature of creativity, and creatives. The idea of chucking everything away and starting again is really interesting - and if the planner has written a half decent brief, that sort of zest should manifest itself in the work. Of course, it is also potentially problematic - the way Lagerfeld is implies someone who wants to shut themselves away, and not take any guidance from anyone else (which is rubbish - he's met a friend of mine/'borrowed' one of his ideas). And this, if applied to advertising, suggests a sort of creativity which is at odds with the notion of sociability, of creating ideas that get infused into culture (which is when, I think, advertising is at its best). I think Lagerfeld is a fascinating man (anyone who loses 6 stone in little over a year has to have an iron will), and I'm going to enjoy seeing how creativity, both advertising and beyond, continues to manifest itself in the light of technological advances. When it comes to advertising, I'm with Laurence Green's article - I think the best work taps into people's innermost beliefs and desires, and makes them want to play and engage with it. Do you have a full copy of Green's article Will? Angus, I thought that WAS the full version..? Not a load of old cobblers..